THE TASTE OF BURLOAK IS BACK AT CHOP! The Taste of Burloak is back at Chop Burlington/Oakville until March 10th. Enjoy a special two-course lunch or three-course dinner menu comprised of some our favourites, including 100% Canadian Beef and responsibly sourced seafood. Satisfy your lunch cravings with selections from our Taste of Burloak feature menu. Enjoy your choice of one starter and one entrée for just $20 per person. Choose from Artisan Greens, Caesar Salad, or a feature soup for your starter. Then, power up for the rest of your day with your choice of lunch dish like our famous Chop Burger, a delicious Steak Sandwich, or our new Nashville Chicken sandwich featuring buttermilk fried chicken drizzled with a sweet & spicy hot sauce. 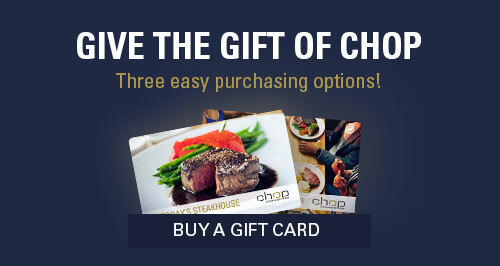 Yes, you can have the ultimate steakhouse experience over lunch! The Taste of Burloak Dinner Menu offers culinary delights developed by Chop Executive Chef, Stephen Clark. Start your meal with a soup or salad, then choose from a selection of delicious entrées, with a variety of steak, chicken, prime rib, and seafood options. For those with a sweet tooth, indulge in one of our favourite desserts - the ultimate finish to your dining experience at Canada’s best steak restaurant. Don't miss your chance to experience Taste of Burloak at Chop Steakhouse & Bar at the Sandman Hotel Oakville. Follow us on Facebook and Instagram, and share your experience with us. Make your reservation today by calling us at 289-881-7250 or reserve a table online.